If you read my review you know I’m a hard-core hop head, I live for the aroma and intensity of Imperial IPA’s. 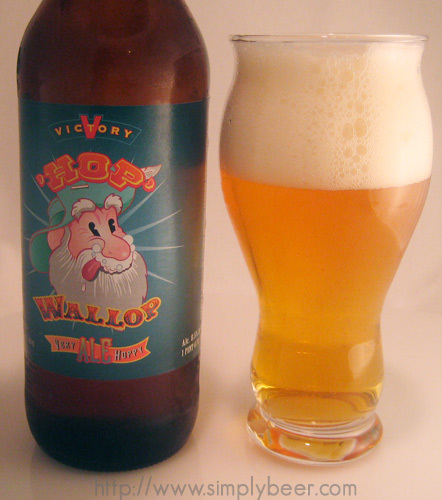 I’ve enjoyed the Victory Hop Devil IPA many times over the last several years, but surprisingly I’ve never had the Victory Hop Wallop Imperial IPA before. As with most IPA’s and APA’s in my beer cellar, I try not to let them sit to long so the hops don’t dissipate. This is beer is well carbonated; pour gently at first, move to a just shy of vertical pour to open up the head. Thick and rich head, cream colored which sits on a crystal clear golden beer. There lots of bubbles rising in this beer to help keep the head intact. Good lacing and great head retention, which is what you want in an IPA so you can keep that intense aroma alive longer. Hoppy! As the name would suggest, there is an intense hop aroma of orangy citrus and bubble gum with hints of malt. If every American IPA smelled like this, I’d be a happy man. Delicious, starts off with a mild orange sweetness which transitions into grapefruit with a nice balancing maltiness and finishing with a lengthy mild bitterness. Great well-balanced flavors. This Victory Hop Wallop goes down very easily, the flavors are will balanced with the aroma. The 8.5%abv is completely masked by the underlying malt and the hops on top. To balance the intense aroma and strong citrus flavor, this would go well with some spicy baby back ribs in a sweet BBQ sauce. By far this is the best beer from Victory in my opinion! I had some IPA that they make last night, but for the life of me cannot remember the name. It was not the Hop Wallop nor the Hop Devil; something I had never seen before. All-in-all though, Victory seems to do a fantastic job!